Today was cause for celebration - yes, at last we've arrived at the final recording sessions of the album! It's been a long but rewarding journey, despite the occasional holdup along the way - if only inspiration came like turning on a tap! Having a stronger narrative than Hexameron meant that writing was sometimes more difficult. But in the end I think these challenges have made the album richer than it would otherwise have been. 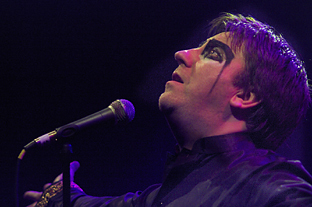 To wind up the sessions, Tony Patterson sang his vocals for two tracks, 'Babel Tower' and 'Howl The Stars Down'. Both tracks have very different moods, and gave Tony the chance to show off his stylistic range. Whilst 'Babel Tower' is dynamic and rocky, 'Howl The Stars Down' is an emotional, heartfelt track. Two voices for the price of one - but better than Tesco's!